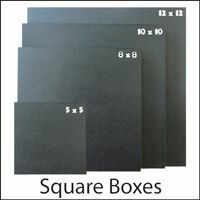 Wildcat's Square Photo Presentation Boxes are great for press books, small albums, and digital formats. We make our own environmentally friendly square boxes right here in Avon, Ohio. Made in the U.S.A.! We've also created a proprietary printing technology that allows us to supply full color images on all of our colorful boxes. Browse these categories under "Square Boxes"